MINNEAPOLIS, MN - FEBRUARY 04: A General view outside of US Bank Stadium prior to Super Bowl LII on February 4, 2018, at U.S. Bank Stadium in Minneapolis, MN. 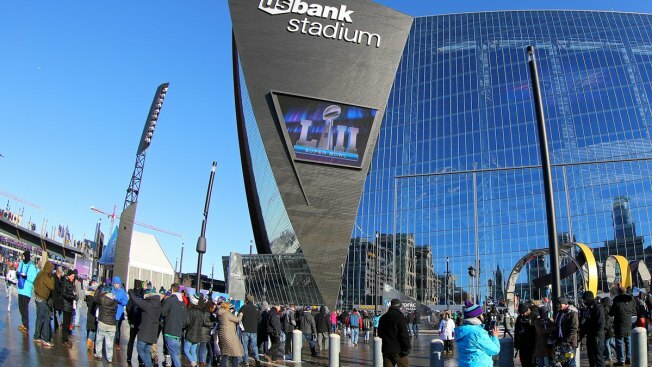 Police arrested 17 activists who blocked a light-rail line carrying Super Bowl ticketholders to U.S. Bank Stadium on Sunday in a protest against police brutality and privileges enjoyed by wealthy visitors that shut down trains for more than two hours. Live video from the scene showed officers unlocking or cutting through locks the protesters had used to chain themselves to each other and to fencing at the West Bank Station on Metro Transit's Green Line. The handcuffed activists were loaded onto a waiting bus. Metro Transit spokesman Howie Padilla said all 17 were cited for unlawful interference with transit and released. Metro Transit used buses to ferry passengers around the blockage, and Padilla said the agency was confident spectators would reach the game before kickoff. The shutdown started about 2:15 p.m., and the stop was finally cleared about two hours later. Padilla said Metro Transit respects people's right to free speech and demonstration. Chinyere Tutashinda, a spokeswoman for the activists, said they were protesting police brutality, as well as the light-rail lines being set aside solely for Super Bowl ticketholders on Sunday. Non-ticketholders had to use buses to get around the metro area instead. The Green and Blue lines were a major route for many fans to get to Sunday's game, with security screening done before passengers boarded. The light-rail shutdown came as Black Lives Matter and several other groups staged rallies to protest police brutality and corporate greed. About 300 people gathered at a park as temperatures hovered around 2 above zero with wind chills in the subzero teens and marched peacefully a couple miles to the stadium, where most of them took a knee outside a security gate in imitation of Colin Kaepernick. The former San Francisco 49ers quarterback started a movement when he began kneeling during the national anthem in 2016 to protest racial inequality and police brutality. "We kneel, we stand, we fight," they chanted. "If we don't get no justice, you don't get no peace." Squad cars cleared the streets ahead of the procession as part of an operation that included top officials in the Minneapolis Police Department including Chief Medaria Arradondo, the city's first black police chief, who took over last year amid the political fallout over a pair of fatal police shootings in the city. "As chief I'm certainly aware that there are concerns that our community has had for a long time, and will still have after the Super Bowl leaves town in a few hours," Arradondo said in an interview just before the march.